Home > Blog>News>Katia g-string open and Katia micro with necklace in set or separately. Katia g-string open and Katia micro with necklace in set or separately. NEW Katia open thong and micro thong in brown - gold tones on sight backing. Decorated with rhinestones in the amber color with a gentle touch of pink. NEW Katia open thong and micro thong in brown - gold tones on sight backing. Decorated with rhinestones in the amber color with a gentle touch of pink. 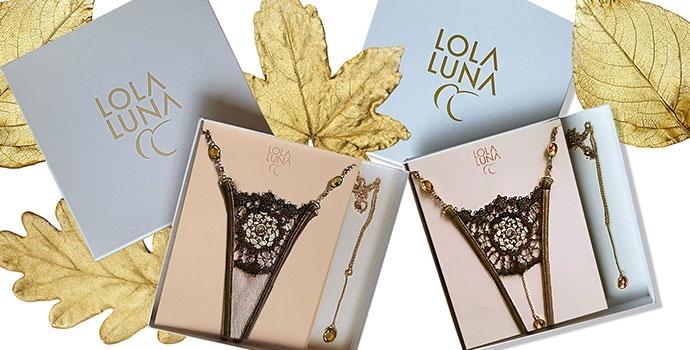 Available as a set with the necklace in gift box Lola Luna or separately. See details on the product page: Katia open | Katia micro | Katia with the necklace. Lilou micro thong with necklace or with bracelet?